Last week the Ministry of Finance updated us on the nation’s debt situation. As expected, the level of national debt has continued to rise from the last updated amount made in December. As it is, Zambia is now desperately indebted to both external and local creditors. However, the national debt will still continue to grow from its present level because it has not even reached its peak. This is because there are other projects financed on new additional loans which were already signed in the past. The national debt statistics will continue to rise for some time as funds get drawn down for these yet to be implemented projects. Since 2012, observers have been warning the government against its unsustainable appetite for borrowing. Local economists, opposition parties, the international media and International organizations like the IMF and the World Bank all called for caution. The advice fell on deaf ears. Unfortunately, the government even now still underplays the existence of a debt crisis in Zambia. Now and then, casual references are made to the debt situation but the words “debt crisis “have been angrily refuted or denied. President Lungu last week addressed Parliament. This was on the occasion of the constitutional requirement for him to report to the nation the progress that has been made in implementing programs for attaining national values and principles. For most citizens, the debt crisis and its negative effects on the economy is what pre- occupies their minds these days. They are stressed and worried. The address to Parliament was therefore a good opportunity for them to hear the President to talk about the national debt and the way forwards. Sadly, there was total silence on this matter. I have written about the negative effects of the debt crisis in the past. Here is a summary of the points. Firstly, a higher than usual number of businesses in Zambia will be closing for lack of customers. This includes both big and small businesses. This is caused by reduced availability of money in the country since large quantities of it will be externalized to go and service debt outside Zambia. In short, there is little money in the country. Secondly, some critical government expenditure will decline for lack of funding. Completion of on-going infrastructural works will suffer the same fate. Thirdly, the national foreign exchange reserves will continue to decline. In 2013 the reserves were in excess of US$3 billion. Today, the Bank of Zambia has only about half of that amount in reserves. With the reduced levels of reserves, our Kwacha is at very high risk of losing value against the US dollar and other currencies anytime. I will now elaborate on some of the negative effects of debt mentioned above because they can be very serious and extremely harmful to our country. Zambia is on the edge and if the authorities don’t take swift and good decisions, the country may drift towards the unstable conditions of the 1980s and 1990s when high inflation and severe loss of value of our Kwacha reigned. I will start with reduced funding for government expenditures mentioned above. In actual fact the country has been experiencing this problem for some time already. All over the country, many infrastructural projects such as roads, classroom blocks, district offices have stalled for lack of funding. Even the Kazungula Bridge project, a joint venture between the governments of Botswana and Zambia is threatened with closure because Zambia is reportedly failing to deliver her contribution to the financial package. In many schools, children are sitting on floors because there are no desks and, in many cases, even chalk for black boards writing is not available. These services are failing because government is diverting money to debt servicing. It has become clear in the past few months that an important category of government expenditure namely, public wages and salaries, is joining the list of expenditure items that the Treasury is failing to honor on time. At the end of February, several government ministries and institutions failed to pay salaries within that month because the Treasury failed to fund them on time. Up to the middle of March 2019, the public universities had not yet paid salaries because the budgeted support from the Treasury failed to materialize. As for local council employees throughout the country, most of them have resigned themselves to the situation in which at any given time they are owed one or two months in salary arrears. This dire situation of consistent salary delays is something that is new in Zambia and it is causing lots of stress among public employees. Unfortunately, the phenomena of salary and wage arrears to public workers may stay with us for the rest of 2019 and even beyond. The reason is that the government has vowed that it shall not default on paying its debt obligations. The government is afraid that if it defaults on even one loan, then all other lenders will demand that they be paid at once even if their specific loan is not yet due for repayment. This is a normal practice for lenders when facing a borrower who is defaulting on third party loans. The revenue and grants it projected to receive in 2019 is not enough to meet the key expenditure items in the budget namely the cost of running government, paying all salary and wages for public workers on time and still be able to service all the public debt. The cause of all this is the sudden rise in money required for debt servicing. Way back in 2011, debt servicing was a tiny amount in the budget. Now, it is the biggest expenditure item and it is larger than the money allocated for Education which has normally been the biggest item in the budget. The 2019 budget claims that it is fully funded and therefore can meet all these expenditures on time. Unfortunately, some of the revenues projected in the budget were only true on paper. In reality such revenues are unrealizable. A good example of this is the envisaged increased taxes from the mines. Similarly, some of the expected loans not tied to any project but meant for general use in the budget (so-called program loans) look far-fetched. The typical lenders under this category (like IMF, World Bank, African Development Bank, etc.) are unlikely to disburse such money in the absence of a credible plan on how Zambia intends to deal with its debt crisis. In short, Zambia does not have enough money to meet the important expenditure categories of running government, development projects, debt servicing and public salaries. In the past few years, the government handled the problem of cash shortage by suspending some development projects and scaling back on important social services as mentioned above already. Since that has not been enough to resolve the problem, the cash conserving measures have now been extended to delaying salaries. Meanwhile, debt serving, which is the main cause of all these problems, has been spared as the government remained current on this expenditure item. By making debt service payments the number one priority, the release of funds for salary and wages will often be delayed. This is why salary arrears have emerged. Once salaries arrears start, it is not easy to dismantle them within months because they are huge. Is it socio – politically sustainable for government to run huge arrears all over the economy including delayed salaries for public workers? Can the government sustain the underfunding of critical social services like health, education and infrastructure just to remain current with debt servicing? How long will the government continue to underfund schools, abandon key infrastructure, delay salaries for public workers so that it is able to service the large debts that it has brought about itself. Zambians have already been stressed by rising prices, deteriorating business climate, stagnant incomes and yet facing numerous new and increasing levy payments to the government. Delaying salaries might therefore lead to labor discontent which the government is unlikely to want to see as we approach the election year 2021. The chances are therefore high that the government could start defaulting on some loans and obligations so as to meet local needs. But the highest and most devastating of all risks facing our country right now is that the government may start to print money so as to artificially meet its financial obligations. Such a situation has materialized before in this country and in countless others who faced similar quagmires. As everyone knows, taking the route of printing money quickly leads to loss of value in our Kwacha and rapidly rising inflation akin to what happened in Zambia during the 1980s and the 1990s. Should this happen, then sadly Zambia would have entered the next phase of the economic destruction that we have come to witness under the PF government. This risk is not a mere academic one. It is real. It is the real risk facing Zambia in the coming months. Finally, it begs the question: Does this government have the capacity to resolve the problem of the national economy? Clearly not, otherwise they would not have caused the problem in the first place. The problem of the debt crisis and all its negative effects has been created by the PF against all advice. Let PFcadre Mwanakatwe rebuff this report. I have read all the negatives in the article. Just like we all expected unpd have no positives for the pf govt and this is why they fail to attract new members apart from babies born from tonga parents who becomes members by default. When everyone else is seeing some positives they want to sound negative. Whats the price of mealie meal today compared to 2017 when these smart lunatics predicted hunger to befall zambia by 2019. Only intelligent lunatics can take this smart lunatic seriously. 11 Jul 2011 · FINANCE minister Situmbeko Musokotwane says “the country has a backlog of infrastructure development that needs to be addressed immediately”. It’s like his entire tenure as minister of finance was a failed project. How were you to address it immediately, mmmh? You had your time dotoro, but you failed. What makes you think you can do it better this time? Failed project. Sela babombe ababiyo. You had your time d.o.t.o.r.o, but you failed. What makes you think you can do it better this time? Failed project. S.e.l.a b.a.b.o.m.b.e a.b.a.b.i.y.o. Dumb aszes. Zambia has reached rock bottom. There’s no cash in circulation, treasury reserves have been depleted. IMF has refused to borrow reckless PF-Govt any more monies. Even Chinese are not eager to give thieving PF any new loans. We’ve been down this road before in the 80s & 90s and we all know how it’ll end. Inflation, suffering, shortages, hunger, inflation, strikes etc. Why do we like to copy from failed nations like Zimbabwe, DRC instead of successful nations like Chile, Botswana, Rwanda? Even ruling party PF is copied from Zanu-PF. Civil Servants go 6 months without pay They stay quiet while their families are suffering. When Prime TV which was highlighting their plight is closed , the still remain quiet. In the 60’s our fathers stood up and fought for our independence.In the 80’s-90’s we stood up and fought for multiparty democracy. The current generation of Zambians is busy singing “sonta epo wabomba” and “dununa reverse” while civil servants go unpaid and the economy is crumbling. These people born after the 90’s are the worst , generally have no heart for themselves and pose a danger to the future of the nation. At UNZA, we are just getting our salaries today 21st March 2019 for February Sir. I’m wondering when we will get our March Salaries. Some chaps will tell to stop depending on Government yet these politician starting from the President 100% depend on Government. Good piece from a very sober mind!! The debt doom sermon. Always being preached but no doom. Ba Musokotwane fully knows revenue collection is always a challenge in the first Quarter for all Govts in Zambia. With many people being dependent on agriculture, the harvest is not in before May. So no tax paid. Pontificate like that and doom does not come, what do people make of you and those you represent? Stop shooting yourself in the foot. True this website is visited so often by lunatics. For them all they see in human with divergent views is tribe. Regardless of the substance they see tribe first. That is one Anonymous and there are a lot more here who are victims of PF brainwashing and vicious campaign which was sustained to bring confrontation and hegemony. We MUST REPUDIATE that kind by any means necessary and teach them that Mutu ki mutu kabatu banang’wi (a human is such because of fellow humans) and not by tribe. Case rested! Edgar Lungu has destroyed our country. Period! Ni Chagwa, Chapona, the Economy has fallen! We are finished! Tasila! Ultimately, North-Eastern Rhodesia is to blame for the mess we are in! Just look at the faces above and name where they all come from-THAT IS “CUUNDU CHAITWA” PARTY UPND for you!! !Can this party with leaders from 3 provinces which have less registered voters rule Zambia?NEVER!! !As for Musokotwane,let him continue yapping about debts while PF develop mother Zambia!! !Musokotwane should know that his days as finance minister are long gone and he will never be finance minister again in Zambia unless he joins a none bantustan party!! 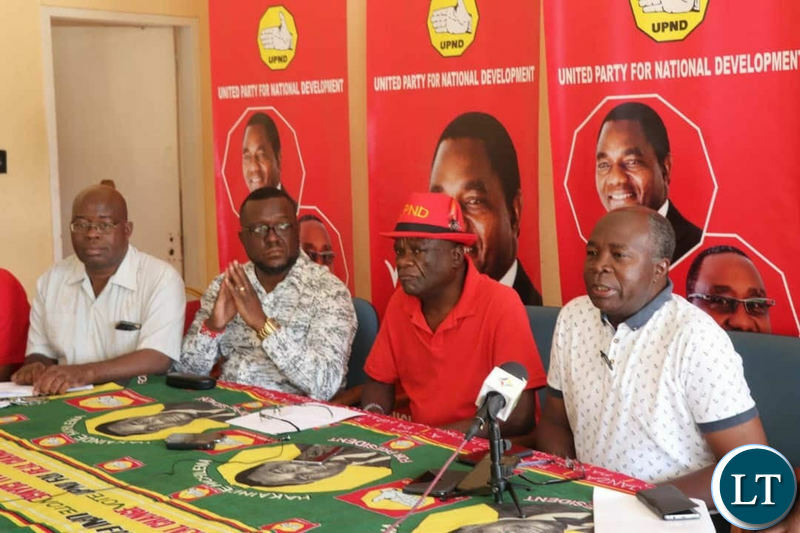 His UPND party is already lying that Katele Kalumba Xaviour Chungu are going to rig Bahati by election,instead of just admiting the fact that THERE IS NO UPND IN LUAPULA!! Just “SONTENI APASHELE PF IBOMBELEPO”. Dr. Musokotwane you are in parliament ‘ surely you have failed to put checks on the Government and yet that is what you the opposition you are elected to do. Shame on you. All you do is critasise. PF can not understand these facts, but Uwafitala akaimwena umwine. Time will tell. Facts are facts; tribe has no place here. Being a peacock will not help. Excellent analysis. My only issue with the writer is the tone of the message which to me says s/he prefers that the govt defaults on external loan repayments to meet local obligations. Given the predicament as outlined, the route the govt has taken is wise. Keep repaying the external loans but don’t incur more! So what happens if the Kwacha drops to 20/$? It is actually difficult to understand why it is still at the rate it is when the Rand is tumbling down just because some criminals ate the money meant for new power stations. The Kwacha is overvalued and can do with some weakening as long as that will not be a habit. @Investing Country Zambia you are waffling by throwing around disjointed economic terminologies. The fact remains that Zambia’s fiscal stance is unsustainable and is placing excessive pressure on other sectors of the economy. We are at a point where low reserves could lead to a rapid depreciation and inflation. Government needs to serious cut spending on non-essential things. How much is in the sink fund, to help cushion the debt repayments ? Can’t read the nonsense. Problem is that Dr Musokotwane is a trib.al. Trib.al Jay Gay, please take the good doctor to the toilet. Where is BR Mumba , Kuodos and the P-F f-o-o-l-s who have forfeited their judgement for senseless support of Lungu and his gang of thieves. Friends, why you don’t see it as a problem when public service workers go for months without pay? Is it that somebody at MoF is just lazy and failing to process salaries on time or is it that there is no money at the treasury? Any honest answers? Where is BR Mumba , Kuodos and the P-F f-o-o-l-s who have forfeited their judgement for senseless support of L-u-n-g-u and his g-a-n-g of t-h-I-e-v-e-s.
Where is BR Mumba , Kuodos and the P-F cadres who have forfeited their judgment? Tribe and accusing others of Tribalism has become a fun game to play in this country now? wait until this country is blown up and there will be no winner. Instead of discussing national issues objectively it’s tribla bla bla. And what is more annoying is that those who are practicing tribalism openly and with impunity in all sectors, all corners are the ones accusing others of it. Zambian’s traded PF’s bigger economic disaster to be “saved” from Rupiah Banda’s small time alleged corruption.That’s like trading a Mercedes for a bicycle. Ba under5 bufi its only February that have been delayed. …not the six months you are saying! No message just alarming Zambians, what a de.monic way of doing things. Debt free policy pronouncements are nothing but propaganda. Debts are the result of poverty and underdevelopment coupled mistakes of the past. Environmentally precarious regimes are located in the poor developing world. Remember the drought that paralyzed the economy due to an unprecedented energy crisis? The rail line has started moving albeit slowly. Slow is not good enough but slow is better than standstill. Enjoy the peace and friendship of the people. In some countries, that is fiction. It is each one for himself and God for us all. New universities make a lot of sense. New hospitals make a lot of sense. New road works make a lot of sense. New airlines make a lot of sense. New industrialists make a lot of sense. Yes?